Down by the sea in the late summer. A wee look at a road in the Algarve. 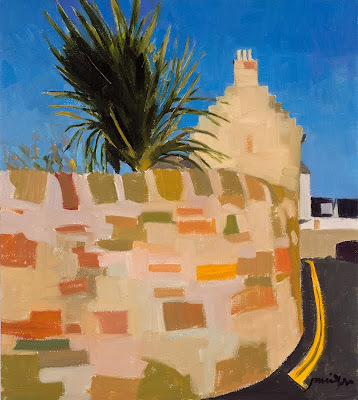 I'm currently working on a couple of paintings set in the road. Good to see some sun. Love the red guitar Brian. Dougie Harrison and Duncan McCallum playing an absolutely terrific set. A great time was had by all when 'Beyond The Blues' played in the village hall on Saturday. The evening lasted nearly three hours and was just terrific. They have put together what can only be described as a 'roadshow' with several sets highlighting different styles of music though the majority of the concert was the blues. Felt like some autumn colour. These leaves were in a friends garden. 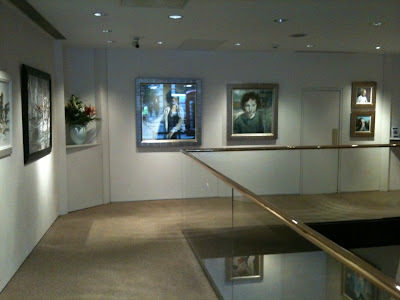 These two photos were taken in The Fleming Collection gallery just before the opening of the finalists exhibition. 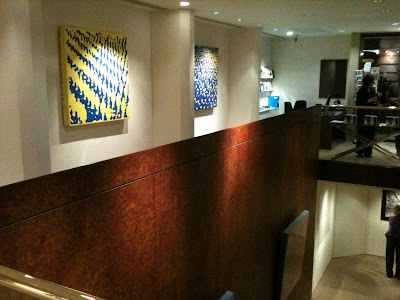 It's a lovely gallery and the work looked great. This is 'City Lights' by the late Graham Murray. Graham was an art teacher who taught in and around Glasgow. During the war Stanley Spencer lodged with Graham and his wife Charlotte and worked on his shipyard drawings and paintings. Graham exhibited regularly with the RGI and in several galleries up and down the country. This painting belongs to his niece Elsie in Australia. Coming soon is an exhibition at the Mansfield Park Gallery in Glasgow. 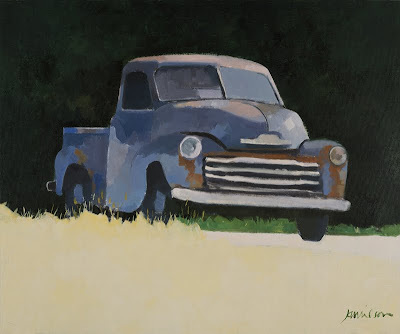 I'll have more details in a day or two but the painting of the old pick up truck will be one of the works on show. Going through some images I came across this and thought it an antidote to the cold. Summer colours. It's in Elie in Fife. 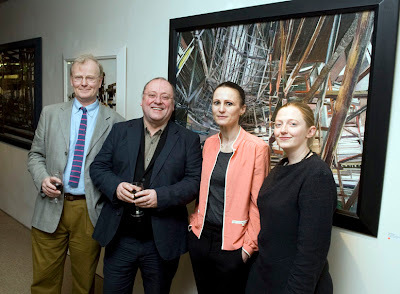 Pictured here are myself, actor Alex Norton, winner Patricia Cain and Keeper of Art for the Fleming Collection Selina Skipwith. Since winning, Patricia has had several offers including being asked to do some paintings of oil refineries. 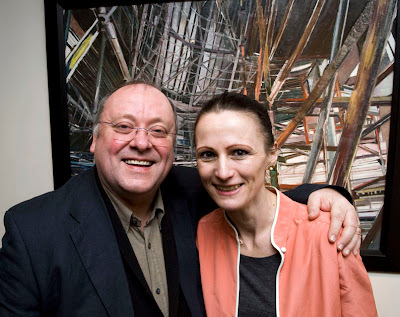 Actor Alex Norton with Aspect Prize winner Patricia Cain in front of the painting which The Fleming Collection have added to their collection of Scottish Art. The opening was a great success and the winner somewhat overwhelmed. This was the only way to reach friends Howard and Eileen in their cottage. We had a wonderful evening. The moon has been quite spectacular over the last couple of weeks. Walking at night is a treat whilst moonlight illuminates the snowy landscape. The colours in the sunsets are just wonderful at the moment. It snowed again overnight and Thursday is looking to be the coldest day yet. Happy New Year everyone. 2010 starts with this morning's snowy view of Arran from the garden.